I think shopping for men might actually be my favourite! They’re so easy to please and usually just happy when you think of them or surprise them with something, even if it’s just little. And if you’re lucky, the guy in your life is more casual and laidback and pretty much likes whatever you select. 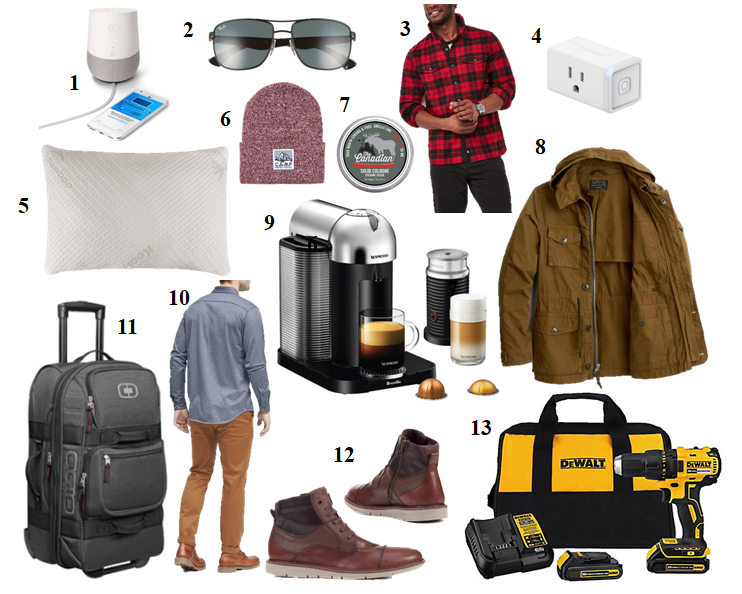 So for this gift guide – Christmas Gifts for Him – I shopped around for some new products this season that I’m really excited about and I am also sharing items my hubby already has (and uses on the regular) that will most definitely be a hit with your guy too! Promise. I’ve picked 13 items below that you should consider getting the man in your life! It could be your dad, boyfriend, guy friend, brother, or husband. My husband owns #2, #3, #5, #10, #11, an older style of #12 and, of course, #13. Roots Algonquin Flannel Shirt – I’m all about Buffalo check this season and the flannel shirt is timeless with the elbow patches. I like that it’s versatile; he can make it more “city” or “rugged” depending on how your guy wants to style it. It’s a nice fit and true to size. Good for your brother, dad, husband, or friend because of the classic style. TP-Link Smart Wi-Fi Plug Mini (HS105) – My brother-in-law introduced me to this cool little gadget and he really does his research and is our techy of the family. You can program your devices on/off from anywhere using your mobile. For example, you can make it seem like someone is home even if you’re not. Great safety tool for the house at an affordable price! Snuggle-Pedic Ultra Luxury Bamboo Shredded Memory Foam Pillow – Give your guy the gift of sleep with a pillow that he can customize himself. I’ve talked about the Snuggle-Pedic before, check out my review here to see if it’s a good fit for him. Camp Heritage Toque – Shop local and get your guy a trendy toque for the season. These toques by Camp Brand Goods are thick and cozy. Your guy can never have too many hats. Good gift to roll up and slip into a stocking. Walton Wood Farm The Canadian Solid Cologne – I’m excited about this new product because it’s totally going in my hubs’ stocking this year. I like that it’s Canadian made, light for traveling with, and has a really nice subtle scent. It’s a great change from his usual spray cologne. J.Crew Field Mechanic Jacket (olive moss) – I’m in love with this jacket and have to put it on my husband’s Boxing Day shopping list. Fingers crossed they’ll have some left because it’s a hot item. The two colours (green and navy) are rich and would look great with jeans, cords, or chinos. Good for the fashion-forward guy in your life. Nespresso VertuoLine Coffee & Espresso Machine – The Vertuoline is a great choice if you want an espresso machine + coffee. I found this article breaking down all the details on Nespresso’s lineup if you’re having a hard time choosing which one might be the best fit for your dad, husband, or boyfriend. You can also snag the VertuoLine with Aeroccino 3 by Breville if you want the milk frother!!!! Worth every penny for the caffeine lover in your life. Banana Republic Luxury-Touch Shirt – This shirt is the definition of soft. It’s a little bit thicker and roomier but a nice alternative to some of those restricting dress shirts out there. OGIO Layover (black pindot) – I am a BIG fan of all OGIO luggage and bags; they really make great products. This layover bag in particular is a nice size for a weekend trip or taking through the airport. GEOX UVET (browncotto) – My husband loves his GEOX dress shoes and boots. They’re amazing quality -comfortable, durable, and long lasting. He loves them so much he is always polishing and taking care of them during our rough winter conditions in Calgary. His favourite feature? The quick and easy access zipper to slip on and off. These boots would look good with jeans, cords, or chinos. Dewalt 20V Li-Ion 1/2 inch Cordless Compact Brushless Drill Driver w/ 2 Batteries & Charger – Every guy needs a trusty cordless drill and this one is the BEST…so he tells me. It actually holds a charge!!! If you’re looking for smaller items, take a look back at my Stocking Stuffers for Him post from last year or check out my Valentine’s Day Gifts for Him post for other ideas like headphones, shoes, men’s accessories, etc. Tell me what you think your guy might like best in the comments below!